Senior center Pallas Kunaiyi-Akpanah once again dominated with an all-encompassing performance Sunday, as her 21 points, 15 rebounds, and three blocks led Northwestern Women’s Basketball to a 72-46 victory over conference rivals Wisconsin. However, Wisconsin was able to limit Pallas’s scoring in the first half thanks to 6-foot senior Marsha Howard and 6-foot-2 freshman Imani Lewis, two players whose strategy is to use their size to their advantage by out-rebounding their opponents. Wisconsin’s dynamic duo limited Pallas to six points in the first half. Realizing that she needed a new game plan, the 6-foot-2 senior came out of the locker room for the second half with increased intensity. “I started spreading the floor harder. When I create that open space, it’s easier for my teammates to find me,” Pallas said. At the start of the third quarter, Pallas powerfully made her way past both Howard and Lewis, finishing a tough layup while also drawing a foul. This tough play caused Pallas to cry out an intense roar in celebration. This play set the tone for Pallas in the second half as she compiled 10 points and five rebounds in the third quarter alone. Scoring outbreaks mark nothing new for Pallas. The 6-foot-2 center has been instrumental for the Wildcats this season, averaging over 10 points and 10 rebounds per game. Additionally, Pallas is tied for second in the Big 10 Conference in average rebounds per game. While Pallas’s second half dominance proved vital for the Wildcats, Head Coach Joe McKeown’s adjustments between the first and second quarter was just as important. “In the first quarter, we didn’t get good shots- we weren’t attacking the rim,” he said. “We talked about how we need to make sure Pulliam and Hamilton get shots and how we needed to lock it down on defense.” Here, McKeown is referring to standout sophomore guards Lindsey Pulliam and Jordan Hamilton. Northwestern would answer the call, forcing five turnovers while limiting the Badgers to just two points in the second quarter. 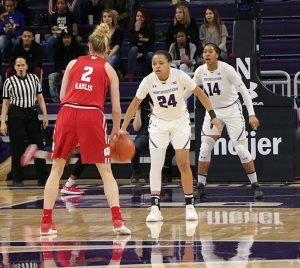 Northwestern also began to channel their offense through Pulliam, whose slick ball handling skills caused her to be fouled by Wisconsin numerous times. Pulliam would make 11-of-12 free throws as a part of an outstanding 21 point performance. Wisconsin players couldn’t cut their losses either. The Badgers shot a mere 24.6 percent on the night as this game extends their losing streak to five games. With the victory Sunday, Northwestern moves to a conference record of 4-3, a record which matches their total amount of conference wins from last season. While confidence levels are high after commanding wins such as these, Coach McKeown said he wants to make sure that his team doesn’t become overconfident. Northwestern travels to Lincoln, Nebraska to take on the 4-3 Cornhuskers on Thursday.